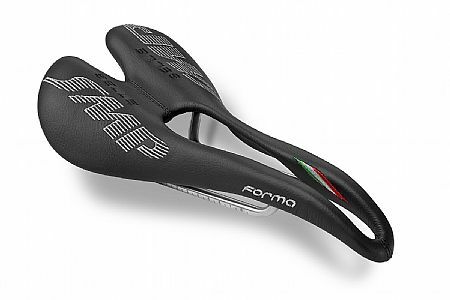 Selle SMP Forma saddle is the most comfortable I have ever ridden. I ride 6 to 9 hours per week depending on the time of year. Longest ride of the week is in the 3-5 hour range. Generally ride 5 to 6 centuries per year. The saddle just fits. Even though there is no padding, I have no pressure points and no chafing. I tried every Fizik over the course of about a month and several Specialized seats. Then just rolled dice and ordered one of these. It took me a very long time to get it dialed in. I just moved it to my new bike and got it dialed in right away. Its a very different kind of saddle. You can roll your hips forward further and get flatter on the bike - if you want to. This seat, for me, has the least amount of pressure where you don't want pressure. I only miss not having padding after about 60 miles, but that is a long ride for me. Saving up for another one for the bike I just pulled it off of. I cant imagine riding another flat seat. A little pricey, but this is a great saddle. I have ridden up to century rides and the ride stays comfortable. The seat rails are right at the seat width near the front, so if your fit requires the saddle to be pushed far back, finding a seatpost with a clamp that does not extend out past the seat edges will be challenging. Hard as wood is an apt description- you can rap your knuckles on this thing and draw blood. Your first several rides will be filled with regret- what the hell was I thinking- this is like hiking all day and then sitting on a rock while cooking over a campstove. You'll fiddle with the setback and angle, think more than once about returning it, but damn, once you get it dialed in, this is a pretty magical saddle. It definitely disappears in the way you really want this particular piece of equipment to. The pressure relief in the perineum region is profound. If you're suffering at all from discomfort, numbness, etc. down there, make the jump to a cut-out saddle sooner rather than later. I rode a Fizik Arione for years, and it was fun while it lasted, but I've lived to regret it. The aesthetic is great from all angles too. Steve Hogg's online article convinced me to try the Forma. Remarkable. Hard as wood but the best-fitting & most comfortable saddle I've owned. Perhaps the SMP Dynamic is a better choice for longer rides, but then perhaps I should replace my worn-out bibs. Either way, I'm buying another SMP for my second bike. This saddle fits superbly. Was initially fearful that no padding would make it unrideable, but need not have worried. Google Steve Hogg's article on SMPs. This is a unique saddle but I find it very comfortable. So far so good, but I have to put more miles on it to give a rating. i will check back later.